Hun Middle School teachers are brilliant scholars who are energized by this unique age group. Their fun-loving nature is an essential skill for inspiring and motivating their students and they’re not afraid to use it. They are quirky and entertaining. But they are also highly educated, astute, and sophisticated academicians. They are multi-linguistic masters, professional artists, guitar-wielding poets, coaches, equality advocates, rocket, robot, and boat engineers. They attended schools like Oxford, Columbia, University of Pennsylvania, Tufts, UNC, and the Rhode Island School of Design. 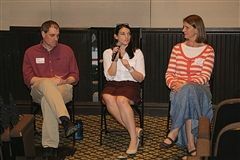 Study Strategies teacher Dayna Gash joined a panel of experts on April 19th, who spoke at a screening of the documentary Angst at the Princeton Garden Theater, a movie exploring anxiety in children. The film features students who share their experience and symptoms, ranging from stomach aches to panic attacks, as well as clinicians who explore the difference between normal worry and a more significant anxiety disorder. When Jennifer Anderson first visited The Hun School of Princeton campus in 2013, she knew she was in the right place. of Middle School faculty hold advanced degrees.